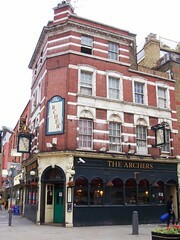 A traditional boozer at the end of Brick Lane, near Aldgate East Station. There's little adornment to this small pub room, where the bar faces doors at either end of the room, and regulars sit propped along the bar area. It can feel pretty cramped when there are more than a few people in, but the prices aren't too high and it's friendly enough. Despite the now very aged paeans to ale which adorn the walls, presumably from a previous incarnation of this pub, there is no ale on handpump (NB: according to the Apr/May 2016 London Drinker magazine, this has since changed). They do have draught Whitbread bitter, and John Smith's Extra Smooth (£2.30/pint in August 2008), as well as basic lagers. A pint of lime and soda was £1.60 in April 2011. Note that as of April 2011 they accept cash only. Accessibility: A step to get in at both entrances. Level access to the ladies' once you're in, but the cubicles are a bit of a squeeze to get into. Last edited 2016-04-02 07:59:36 (version 8; diff). List all versions. Page last edited 2016-04-02 07:59:36 (version 8).